Call and come into Vibrant Energy Healing Center to order your personal gemstone water bottles and/or vials today. Start feeling the rejuvenation that gemwater conveys directly from Mother Earth. Because 65% of the human body is water, nothing impacts our well-being more than the quality of the water we drink. Water is the elixir of life and drinking healthy, vital water is important due to the many functions water performs in our body systems, like assisting in weight loss, strengthening the immune system and slowing the aging process. The use of gems to vitalize water is a traditional art which was known to the ancient Greek and wise men and women during medieval times. Recently, this ancient tradition has been rediscovered. Gemstones have the ability to store energy. Each type of gem, by nature, has its unique kind of energetic information. 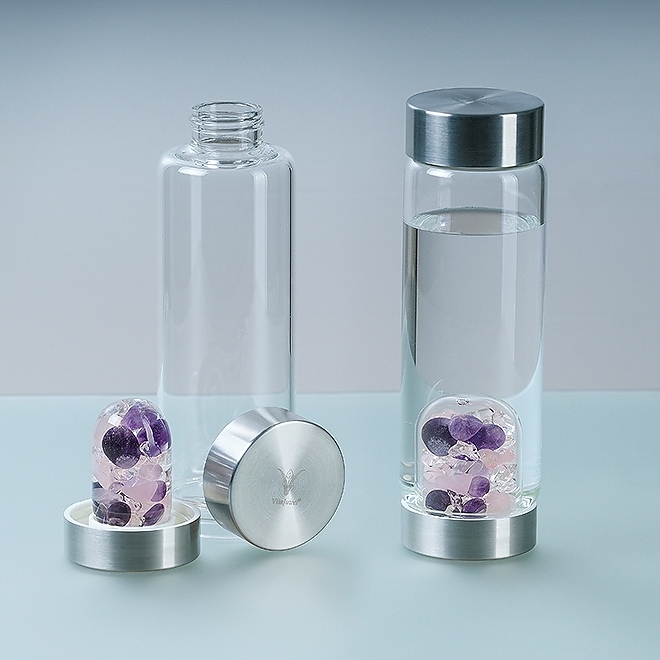 The gems inside the VitaJuwel vials and water bottle gem pods transfer their information to the water and, thereby improving the waters' vitalization level. An effect which regular water drinkers might even be able to taste! The natural element of gemstones regenerates the natural element of water by returning it to the highest state of natural spring water. The water becomes alkaline and has increased oxygen to help bring the body and it's systems back to its natural, optimal state. Create your own fresh and pure gemstone water! Energize water with the healing power of hand-selected gemstones available in 17 different blends tailored to suit every need you might have. Each blend focuses on different aspects. Finding the right blend for you depends on what purpose you'd like to create and where your special needs and wishes lie. Many beginners start with the WELLNESS blend, as this basic, well-balanced composition was used to inspirit water for hundreds of years by many generations of gemwater lovers. Wellness Blend - Amethyst, rose quartz, rock crystal. Amethyst stimulates and soothes the mind and emotions rose quartz fosters tranquility. An ancient art meets a modern twist. Rediscover one of nature's most valuable secrets with unique VitaJuwel gemstone vials and water bottles. 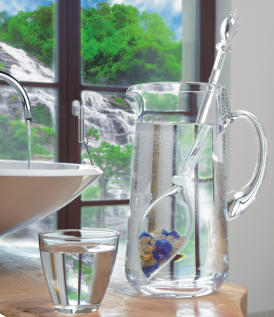 Vitajuwel's innovative design has revolutionized gemwater. Gems are sealed inside lead free glass. No need to clean gemstones, they are always hygienically clean and ready to use. The gem pods for the water bottle may be switched out any time you want to focus on a different intention. “You're not sick, you're thirsty” states F. Batmanghelidj, M.D. in his books. Water is your body's principal component. It flushes toxins out of vital organs and carries nutrients to your cells. Even mild dehydration can drain energy and make you tired. Experts recommend 6 to 8 glasses of water daily. Do you drink enough? Many people have lost their natural feel of thirst. Regain this feeling! Your body may thank you with unexpected positive effects. Gemwater is the true elixir of life! Your body needs well functioning cleansing processes for stable health. No other beverage than water – pure, vital, and free of harmful substances – is better to support these extensive tasks within our body. Aquamarine means "water of the sea" and this gently blue stone is said to be calming, soothing, and cleansing, just like a refreshing swim in the ocean! Not to forget its great side effect: Inner purity is also visible on the outside. Are you looking for a exceptional present for your loved one, a wedding gift for very good friends or for a Valentine's Day surprise? Or would you like to bring a little more fire in your everyday life? Blazing, scarlet red garnet is described as a symbol for sensuality and passion. This powerful, energizing stone is perfect for lovers! Open all of your senses to the vibration of that unique VitaJuwel gemstone blend with a glass of precious gemwater. All you need is ... water. And when you add rose quartz, the quintessential stone of love, anything is possible! Rose quartz is used by experts to release emotional wounds and traumas, to balance emotions and bring peace and calm. This balance is said to relief stress and ease anxiety. For water lovers, this is the perfect blend. However, we won't be held responsible if you find love of self and love of life. In order for the heart to beat, it needs water. Change the world with your creativity and break fresh ground! Get inspired by enjoying a glass of gemwater from this enchanting combination of the captivating rutilated quartz and the deep, celestial blue lapis lazuli – a symbol for spirituality in ancient Egypt about 6,000 years ago. Your brain is made up of about 75% liquid. Research has revealed that drinking water when we feel thirsty boosts our brain's performance. Feed your brainpower with this very special blend. Alternative practitioners recommend this blend to strengthen your inner flow and to gain and maintain your momentum. Discover your inner peace and harmony again. In this fast paced, complex world we often tend to forget that our mind sometimes needs to rest in order to be able to focus on what is really important. Settle down for a minute, forget everything around you and indulge yourself with a glass of gemwater to get fresh wind in your sails. The percentage of water in our children‘s body is more than 70%. Especially during phases of growth, drinking a sufcient amount of healthy water is imperative. A kid‘s sensation of thirst is not fully developed. It has to be regularly reminded to drink. Drinking enough fresh water enhances concentration and the ability to learn. VitaJuwel Kids with its colorful and bright tones will turn „magic water“ water into the new favorite beverage of your children. "In order to carry a positive action we must develop here a positive vision." - Dalai Lama. Jet black Shungite is truly a visionary stone Like diamond, it is a form of elemental carbon. It is mined in the remote Russian region of Karelia, where Czar Peter already made use of Shungite's purifying properties. Discover water completely anew with this gem from another world Share our vision to make gemwater an enlightening experience for everybody. VitaJuwel strives to raise people’s passion for vital water. We blended vibrant Carnelian, “Stone of Life” in Ancient Egypt, with Halite, the “Salt of Kings”. Carnelian plays a leading role in the famed crystal healing tradition of 12th-century abbess Hildegard of Bingen. Like no other stone it symbolizes the joy of living. Open yourself to his exquisite blend and absorb its radiating joy with every passionate sip of gemwater. St. Hildegard declared nearly 1000 years ago: “All the green of nature is concentrated within the Emerald.” This lush crystal has been a source of fascination in many cultures and was considered a symbol of eternal life in ancient Egypt. Louis Pasteur said: “We drink 90 percent of our illnesses.” Your body needs a sufficient amount of fresh water for well functioning cleansing processes and a stable health. It's a natural way to help you leading a better life. Become vital! This basic, well-balanced composition was used to inspirit water for hundreds of years. Experts claim that amethyst stimulates and soothes the mind and that rose quartz fosters tranquility. Having this vial in a VitaJuwel decanter on your dining table will let you experience water totally anew. Customers find gemwater with this harmonic blend to taste smooth and mild. If you're unsure, with which blend to start your VitaJuwel collection, choose this one! Diamonds are a gemwater lover's best friend. The most precious gem on earth was believed to channel divine energy and was reserved only for kings and queens. Our customers say that no other gemwater tastes as intense and apollonian as this exclusive blend. Try it once and you'll never again drink ordinary tap water. It makes a perfect gift for that special someone you treasure most in your life – it is as unique as a diamond ring. It is jewelry for your water! In Golden Moments we pause for an instant, reflect the things in life that truly matter and leave everyday's worries behind. Those precious moments cannot be weighed in gold. It's crystal silhouette reflects its unique ingredients: hand-mined gold from the river Rhine in Germany, exotic Halite Salt (the “Salt of Kings”) and a piece of fiery Garnet. We'd like to excite you to enjoy more Golden Moments! Traditional Chinese medicine has developed over 5,000 years and recognizes health as a harmonious balance of five elements: Wood for growth, water for reflection, earth for grounding, metal for strength and fire for passion. Every person is a unique blend of these elements. Following this ancient philosophy, we have included one kind of gem for each element in this blend to reflect each attribute. Get your life in balance. Experience this ancient wisdom.